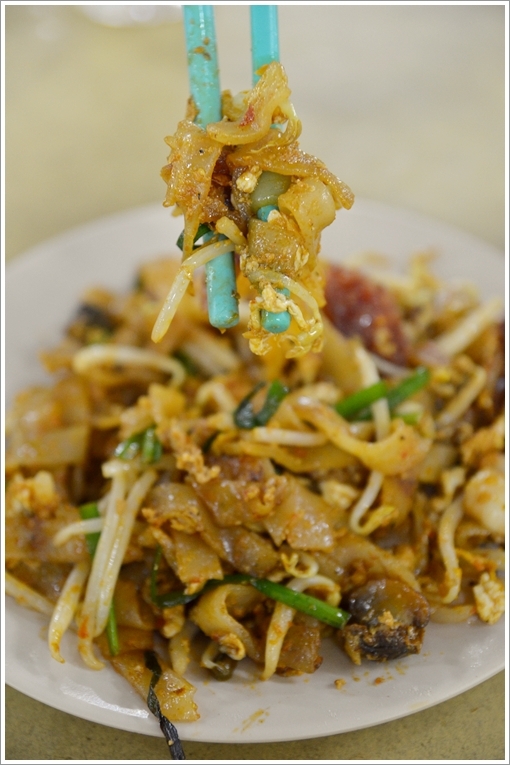 Char Kuey Teow; one of the instantly recognizable Malaysian classic hawker fares much loved by people from all walks of life, transcending generations and territories. First of all, Happy Weekend, people. Was away for a 2-days training stint at One World Hotel in Bandar Utama; and spent the whole day in the function room and having meals at Cinnamon; their in-house cafe. The buffet lunch served was good, with ample varieties; but lacking in quality. When you have more than 3 varieties each of cooked chicken, fish, lamb and beef, then a dedicated Japanese cuisine counter for sashimi and sushi, a distant corner for tempura and dim sum, and even a counter with satay, tandoori, roti canai and various chutneys, it’s hard to do everything to the best extent. Which brings me back to what I had for dinner earlier this week. 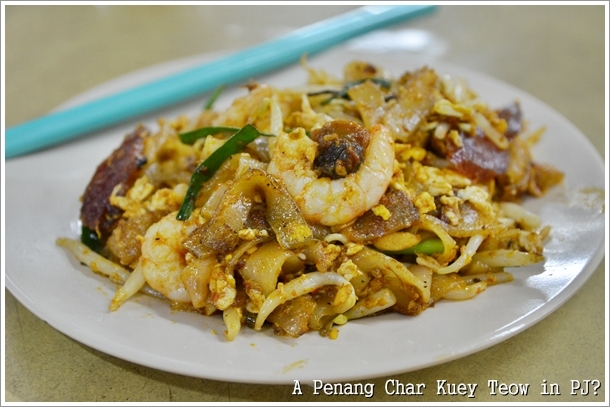 Robert’s Char Kuey Teow in Section 17, PJ. When you see there’s a proof of media coverage on display, it’s bound to be above average; no? Can’t say that this blew my mind off; but for a Penang Char Kuey Teow in Klang Valley, I guess this can be parked somewhere around the upper ranks of CKT in Klang Valley? Read on to find out more. Robert at work. Seemingly, he has branches, or relatives in SS2 and Damansara Kim. Anyone cares to drop more details on this? He operates from about 11am until 10pm daily. And he’s assisted by this lady, presumably his wife? But he was arm-deep in his frying action that evening, and we did not bother to ask much. But the many reviews on the Internet got me all worked up; plus the sheer excitement of tasting a CKT (short for Char Kuey Teow) worthy of an alternative to Penang’s got me all salivating and eyes lit up with joy. A sizeable portion with juicy prawns, waxed sausages (lap cheong), cockles, bean sprouts, Chinese chives (ku chai), finely-beaten egg omelette and aromatic garlic bits made up this famous Robert’s CKT in Section 17. A household name, I would have assumed. First of all, let’s not compare apples to oranges. Loosely tagged with the ‘Penang’ moniker does not make this 100% similar to the real deal up north. 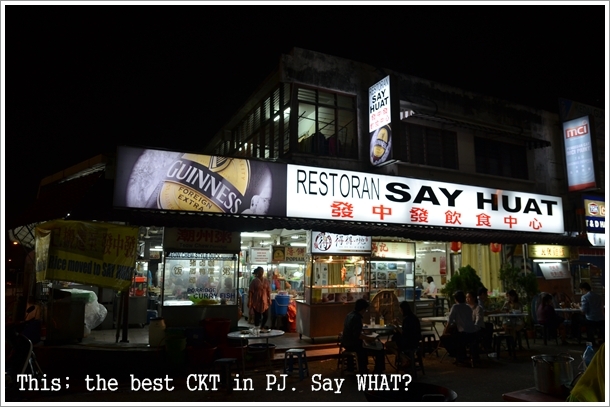 But so far, this has been one of the better, if not the best CKT in KL/PJ that I have come across. Though I can’t say that I have tried much, aside from a few unbelievably horrible versions and one in SS2’s Mee Yoke Lim which was popular with the crowd but disastrous too. The addition of ‘lap cheong’ may be a plus point for those in favour of chewy, sweetish bits of waxed sausages in their noodles, but I don’t prefer this in my CKT, much like how original Penang’s rendition omits this. The combination of savoury, sweet, spicy and umami flavours was almost spot-on though; but could do with slightly more ‘wok hei’ (intense heat from the wok); as the noodles came out slightly soggy and lacking in the charred aroma. Verdict : Worthy of a try when you’re craving for a good serving of CKT in Klang Valley. Just don’t expect this to be the exact replica of your favourite CKT in Penang. 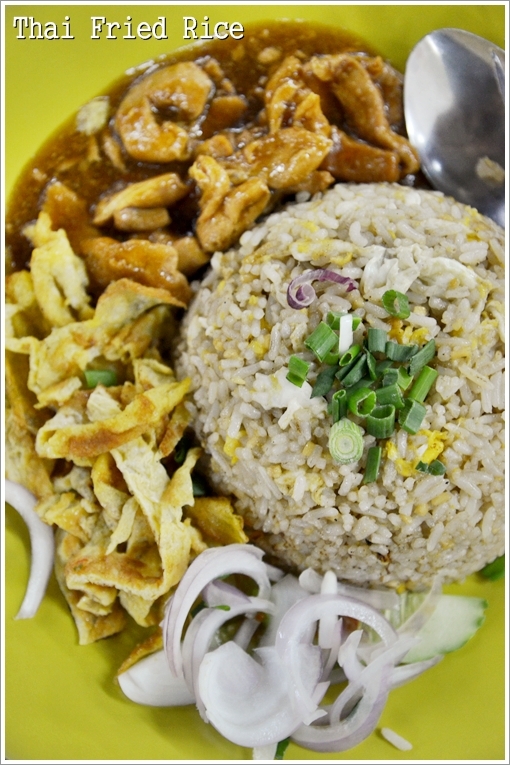 Thai Fried Rice – Reminded me of the exact same dish (named nasi kerabu, of all names) in Penang when we were studying there. Nothing too fancy, but the beautiful presentation of fried rice with eggs and the sides of stir-fried boneless chicken bits in a sweetish gravy was tempting enough. Best to counter all the grease and heat? 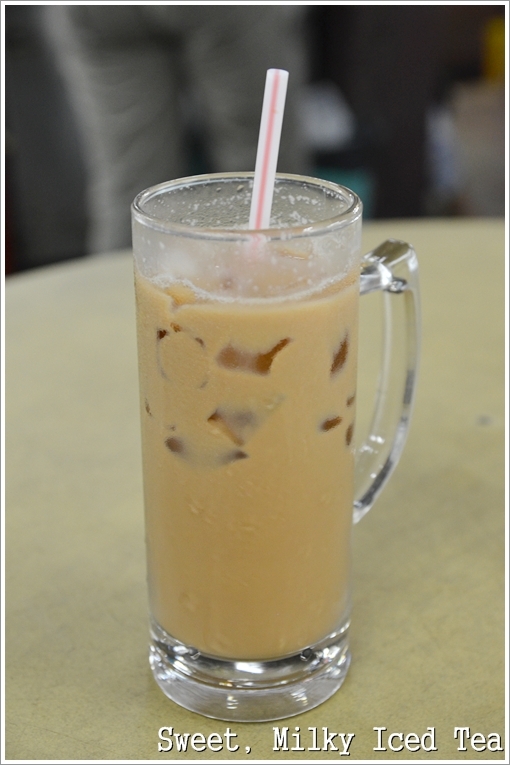 A glass of iced milk tea … just remember to request for less sugar/condensed milk. So far, this got the stamp of approval. But ain’t saying much since I have not tried that many in KL/PJ in the first place. Where else would you recommend? And why the sudden surge of reviews from Section 17* you ask? (Read also this delicious chicken/roast pork/char siew rice place opposite of Say Huat). Well, what I can assure you is that … I have had enough of food from the malls. Seriously. And where best to embark on this street food venture than around older residential areas? *Reviews of Bistro a Table, My Elephant and Food Foundry to come soon. Opens from 11am until 10pm daily. The fried tong fun is good too! And since you’re there, you should probably try the desserts at the “dai pai dong” outside the shop. Oh … in front of the shop you mean? Yeah we did notice a few stalls on the outside and darn a large crowd even on a weekday evening. wah then I must really make my way there to try this CKT! Eh … should, but not a die-die-must-try. Can’t seem to get a darn good CKT in KL as yet. I have just tried it. No ‘wok hei’. Yeah, that’s exactly the point. So it’s not on one occasion only then? It is quite unforgivable. ‘wok hei’ is a pre-requisite. I tried the fried rice too. Not bad. But I dunno what makes it Thai. Haha. The owner or the helpers maybe. But if you read some reviews around the Net, it was claimed to be of good wok hei and such. I was surprised too. Maybe just not in the same league as the charred, smoky aroma of Penang style CKT? I noticed this was sweeter and slightly moist. Yes, sweet. Cheryl said the same thing. But truth be told, some neighbourhood stalls in the Klang Valley do have ‘wok hei’. Okay sure! I eat at wai sek kai often also, but dunno what’s good. Usually settle for grilled fish and ABC. There’s a Robert’s CKT @ ChoyKee in Damansara Jaya (not the Atria lots area but the low rise lots nearer to Petronas/KDU). The stall opened not too long ago (maybe a year?). Anyway, the CKT is frikkin good. The Friar-in-Chief (sic!) is Marko and I think he is Robert’s nephew (do check). Penang fler and fries his CKT with a fiery zest .. and bulging eyes. And also very accommodating to my unusual needs – extra taugeh, tampok hiam chior and 3 liap koay neng. Kakaka. as of 29-SEPT-2013 : Robert’s CKT Section 17, not as good as before, quality drop a lot, the prawn no longer juicy fresh, but in fact give u a normal small prawn like the size of your 20cents, price increased RM5 for small, RM5.50 for big, portion is small as well, siham given less than 5 biji…if wanna a good quality CKT, this one is a big NO NO already…not recommended anyway!